Anton Zaslavski (Lahir 2 Septembr 1989), Lebih dikenali dengan nama pentas Zedd(/ˈzɛd/) ialah Produser Muzik dan DJ Rusia-Jerman. ^ "Biography". 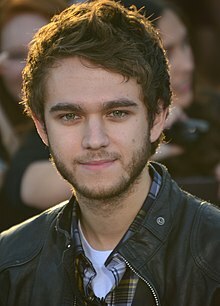 zedd.net (Official site). Dicapai 9 November 2014. ^ "VOTE NOW! Help Decide The Next Pop Superstar of 2013!". popdust.com. Dicapai 10 August 2013. ^ "2013 Video Music Award Nominations: Get The Full List!". MTV. Dicapai 27 August 2013. ^ "'American Music Awards' 2013 nominees, winners – complete list". ^ "Grammy Awards 2014 Nominations, Dance Genre". ^ a b c "2014 Winners". Billboard Music Awards. Dicapai 19 May 2014. ^ Malec, Brett (17 June 2014). "Teen Choice 2014 Nominees: Vampire Diaries and Pretty Little Liars Lead, Catching Fire Comes in Second". E! Online. NBC Universal. Dicapai 24 November 2014. ^ Frith, Vanessa (25 August 2014). "MTV VMAs 2014 'Clubland' Winner Is Zedd For 'Stay The Night'". ENSTARS. Dicapai 25 August 2014. ^ "MTV EMAs 2014: Katy Perry sieben, Ariana Grande sechs Mal nominiert". Musikmarkt (dalam bahasa Jerman). 17 September 2014. Dicapai 18 September 2014. Laman ini diubah buat kali terakhir pada 16:23, 16 Oktober 2015.